Looking for razor sharp viewing on your binocular when you’re out on travel the next time? Bushnell, one of the well-established the brand in the market, promises to offer just the type of binocular you wanted. Bushnell Bear Grylls 8 x 25mm Compact Roof Prism Binoculars is waterproof, and you can carry it with yourself no matter where you want. You can even take it out with you during the foggy mornings, with it being fog proof. The binoculars are an excellent choice for people looking for a quality binocular that is light but does a great job at what it is supposed to do – offer good quality and accurate images. Here is a look at some of the features that you wouldn’t want to miss out on. The binocular lens quality tells about how much good an image you will get. And coated lens help protect the lens from the normal wear and tear. This Bushnell Binocular lens is coated with an optical chemical compound that has been developed to optimize performance and improve picture quality. This lens produces a high contrast image that reduces that reduces the strain on the viewer’s eyes. The coating also minimizes chromatic aberration and color fringing creating a sharp, distinctive image. If you love to take the binocular out with you, you will need it to be light. Most of us want to carry the binoculars around our neck, and big binoculars can be troublesome. Thankfully, this one does maintain a light design without compromising on its sturdiness. The housing is sealed, and this makes it waterproof, and dustproof and this makes it an all-weather gear for travelers. The body is made of a non-slip Armor for a firm grip and also provides the required strength to the body. No more seeing the sun glare back at you when you’re trying to view scenery with your binocular. Twist-up eyecups is a very impressive feature of this binocular; this enables you to use them with or without your sunglasses on. Now that’s a good thing as many likes to wear their glasses on their trips. The binocular has O-rings sealed and purged with nitrogen gas, which makes them water and fog proof. This constructional feature provides them with an advantage and ability to withstand immersion is water and yet stays dry. The nitrogen gas prevents internal lens surface from fogging due to rapid temperature change. Thus these can be used in many conditions. Every binocular user would want this. Good magnification helps you zoom in more without losing the focus. And this product from Bushnell offers good magnification ability. The binoculars have an 8X magnification, which is enough for the regular travel goes as the images are pretty clear and sharp. There is hardly and dispersion in the display. You will need a binocular that produces razor-sharp images, and the image quality depends on the lens and glass quality. The BaK-4 glass is a superior quality prism lens that has been designed to produce brighter and sharper images. Also, the lens system aims to provide a full field of view. Chemical coating on the lens to make it water, dust and fog repellent. Q: Can these be used in places where lighting is low, like concerts? A: Yes, they have high contrast and sharp picture. They also have brightness adjustment that makes them suitable for use at concerts. Also, since they are small in size, they can be taken along easily. But they might ditch you if the place is too big. Q: How great is the focus? A: These are for general use. They aren’t that powerful to be used for long distance use, but yes they are sufficient to fulfill your daily use. 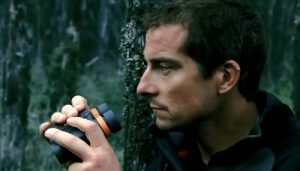 Speaking of the specification and the lens used, Bushnell Bear Grylls 8 x 25mm Compact Roof Prism Binoculars looks like a value for money product. The features are good enough. They are a product that can be considered as a good option for purchase. These are a perfect companion for people who wish to use a pair of binoculars as a part of their backpack and carry them everywhere.